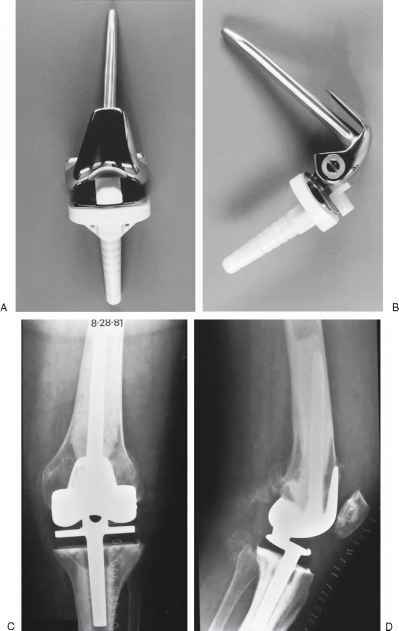 The problems with the early hinge designs led to a new generation of constrained prostheses in an attempt to improve the results over the single axis early hinge designs. The total condylar III prosthesis provides a deepened femoral intercondylar recess into which an elongated polyethylene peg articulates—providing varusvalgus and anteroposterior stability (Figs. 10.1A-D). Extended femoral and tibial stems transfer the loads away from the condylar bone prosthesis interface. Newer hinge prostheses allow flexion-extension, distraction, and some degrees of rotation. The kinematic rotating hinge prosthesis (Howmedica, Rutherford, NJ) is a constrained hinge that allows axial rotation and distraction between the inner tibial bearing and the outer sleeve7 (Figs. 10.2A-D). 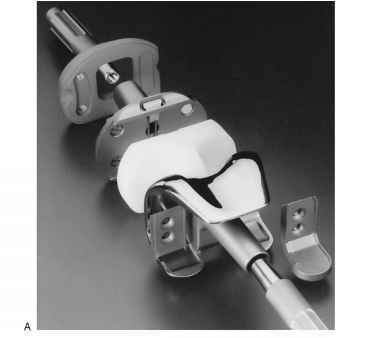 The Noiles knee prosthesis was introduced in the late 1970s as a modified constrained hinged prosthesis. 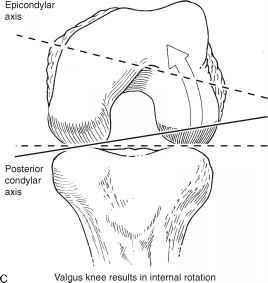 The Noiles has an uncemented tibial stem, set within a cemented sleeve, and reported to allow a 20-degree arc of both medial and lateral rotation in flexion as well as reduced tensile loading3,6 (Figs. 10.3A-B). Figure 10.1. (A) Anteroposterior and (B) lateral photograph and (C) anteroposterior and (D) lateral radiograph of total condylar III prosthesis. Figure 10.2. (A) Anteroposterior and (B) lateral photograph and (C) anteroposterior and (D) lateral radiograph of kinematic rotating hinge prosthesis. Figure 10.3. (A) Anteroposterior and (B) lateral photograph of Noiles rotating hinge prosthesis. Figure 10.4. (A) Photograph, (B) anteroposterior and (C) lateral radiograph of constrained condylar total knee prosthesis. be added to the undersurface of the tibia for similar reasons (Figs. 10.4A-C). The type of intra-articular constraint desired may also be varied with modular total knee systems depending upon the clinical setting. 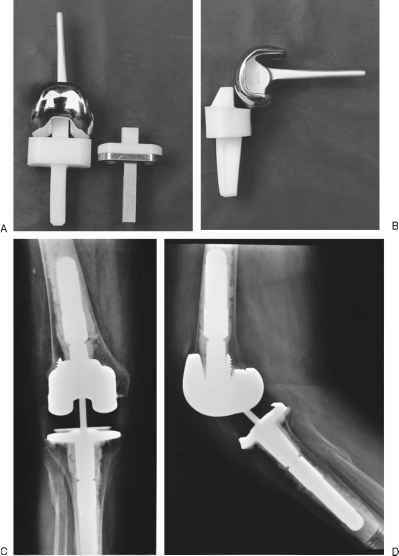 A posterior-stabilized or cruciate-retaining tibial polyethylene implant may be used, or, in situations in which instability is greater, a more constrained tibial polyethylene component may be used that provides a thick intercondylar peg similar to the total condylar III design. What is a knee sleave implant? What is total condylar prosthesis?